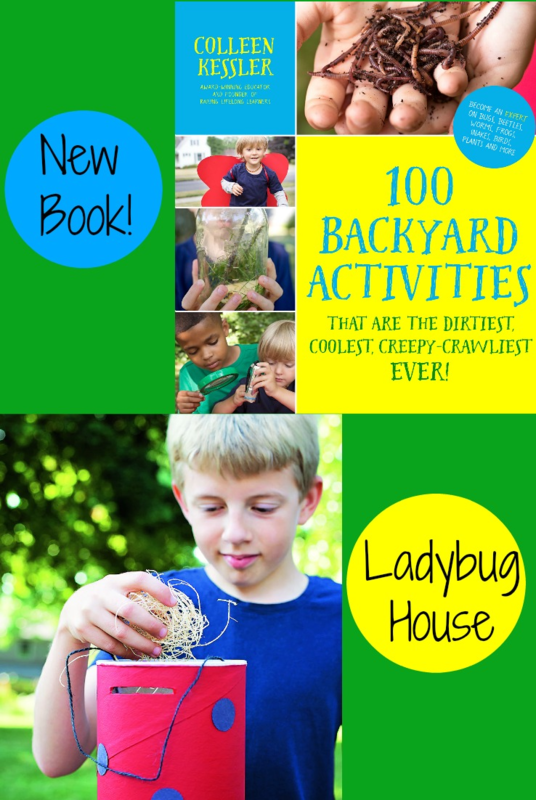 Just in time for summer, Colleen Kessler and Page Street Publishing have released a new playful learning book, 100 Backyard Activities That Are The Dirtiest, Coolest, Creepy-Crawliest EVER! There is a whole world waiting to be discovered right in your own backyard. Kids will delight in the activity suggestions that compel explorations while having FUN learning. 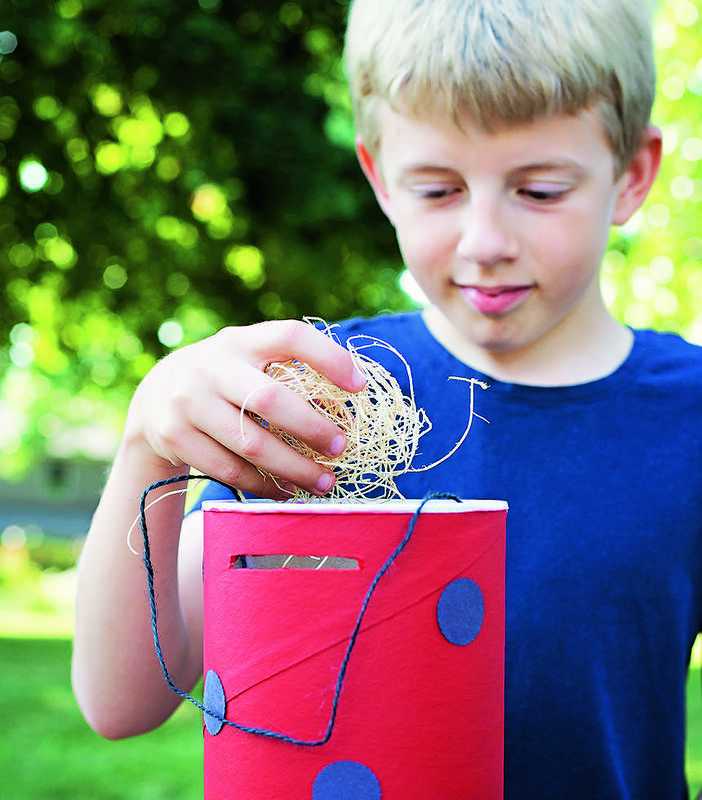 The ladybug house construction is just ONE of the many activities that invite kids to play, discover, build, and learn by doing. Disclosure: this post and others within the blog contain affiliate, distributor, and/or sponsored content and links. Please see the Disclosures page for more information. Ladybugs are important to every backyard. They eat the pests that would eat your tomato plants or kill your pretty flowers. Plus, they’re very gentle and fun to observe. 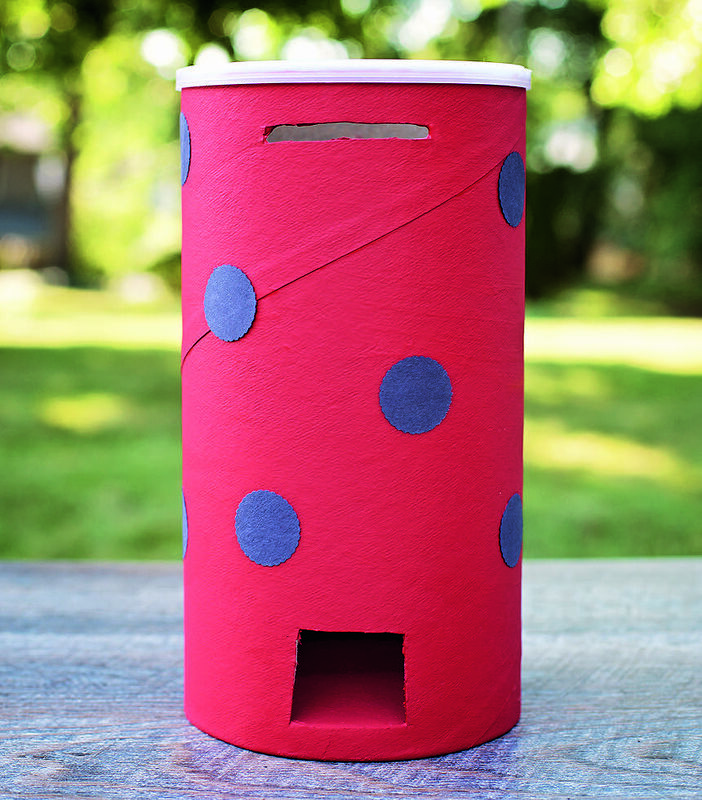 You can attract more to your yard by building a simple ladybug house to give them shelter and a great place to hide from predators. It’s easy! Give it a try! 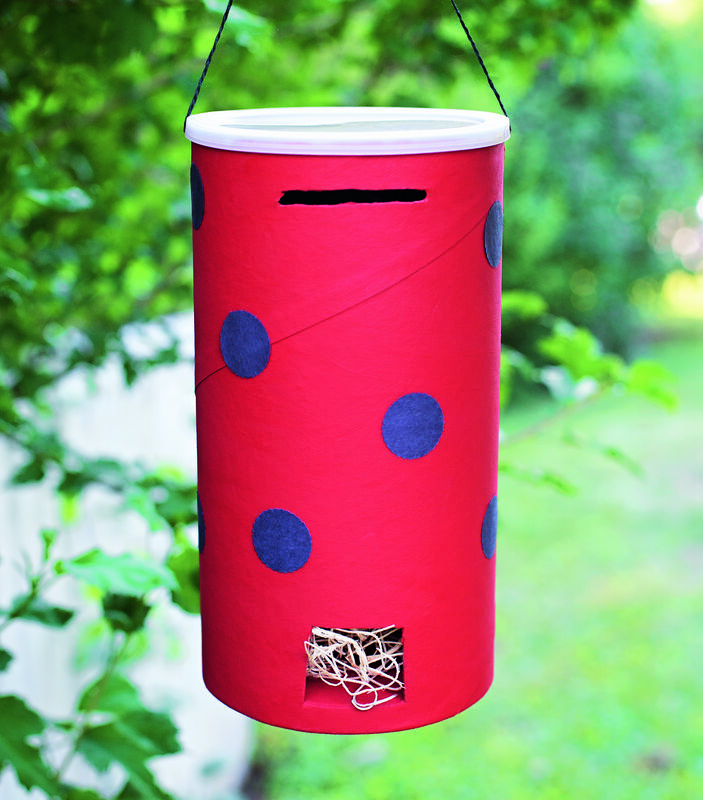 Find a spot outside that’s perfect for painting, then decorate the outside of your oatmeal container. Cover it completely with a base coat of paint and then add fun details. Remember that ladybugs don’t seem to have color preferences, but they are definitely attracted to the light. You may want to use light and bright paint colors to cover your oatmeal container. Let it dry and then seal the container with the spray to help protect it from the weather. Check with an adult before using the utility knife. Cut (or have help cutting) a small window slit on the top of your container. Then, cut a small door at the bottom of the container. Poke a hole on either side of the oatmeal container and string the wire through it to create a hanger. Hang your ladybug home from a tree near your garden or flower bed and watch for new ladybug families to come and set up their new home. If you want, you can use your nature journal to record how long it takes ladybugs to find your house and call it their own. Check on it each day, and draw or write about what you see. About the Author of 100 Backyard Activities That Are the Dirtiest, Coolest, Creepy-Crawliest Ever! : Become an Expert on Bugs, Beetles, Worms, Frogs, Snakes, Birds, Plants and More : Colleen Kessler is an award-winning educator, author, speaker, homeschool mom to four gifted children and the founder of Raising Lifelong Learners. Colleen left teaching after more than a decade to write and speak as an advocate for gifted and twice-exceptional children. She’s written more than a dozen books, including Raising Creative Kids and Hands-On Ecology. She speaks regularly at homeschooling conventions, events, and online webinars and podcasts. Colleen lives with her family in Ohio. About Page Street Publishing Co.: Page Street Publishing Co. produces large format, full-color books, packed with original photography and is distributed by Macmillan throughout the U.S. Page Street is a proud member of 1% for the Planet and donates 1% of its annual revenue to environmental groups. 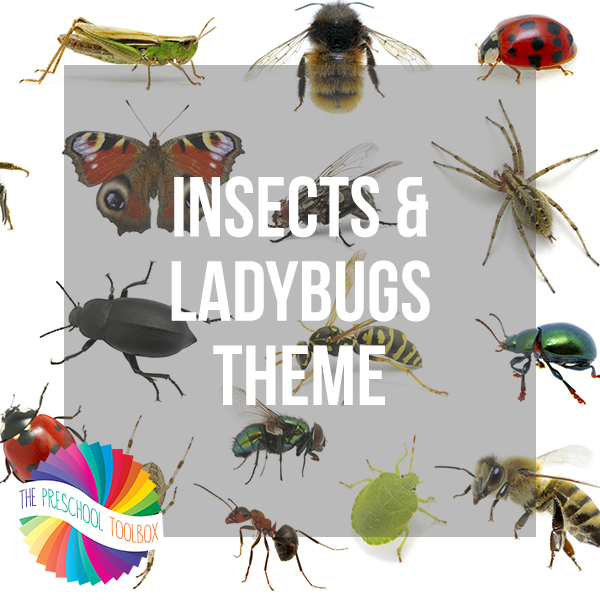 For more Explorations with Ladybugs and Insects, your preschoolers will enjoy learning with our own Ladybugs and Insects Theme – now on SALE for just $4.99. « Super Simple Sensory Name Recognition Bags for Preschoolers!